Each year the Singapore Symphony Orchestra puts on a public concert in which outstanding local musical talent is showcased. 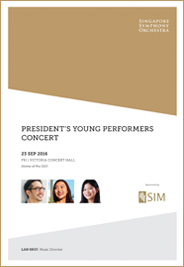 This annual President’s Young Performers Concert gives an opportunity for Singaporeans emerging from the ranks of the world’s music schools and conservatories to present themselves in a professional concerto setting before a paying, if generally sympathetic, public. As a barometer of Singapore’s musical health it is a splendid concept. As usual, the Republic’s President, Mr Tony Tan, was in attendance. It should be pointed out to those who believe that most temporal Asian leaders regard themselves as near-potentates, that the Singapore President’s presence in the concert hall was by no means disruptive. He sits there in an ordinary seat next to his wife, reading the programme notes, listening to the concert and applauding, just like anyone else. The only difference is that he has to look as if he’s enjoying it and cannot take out his mobile phone to while away the boring bits – although, to be fair, President Tony Tan gives every impression of genuinely enjoying the music. One of the wonderful things about Singapore is how so many political leaders support the arts out of personal interest as much as state duty. In fact the only disruption the President’s presence caused was the young girl shimmying up to the microphone on stage and announcing his arrival as if to say “Look at him! He can make his way to his own seat almost unaided!”. If the President was not centre stage at this event, two young Singaporean students were. 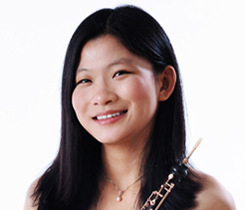 Bernice Lee is studying oboe at the Guildhall School in London, while Jade Tan Shi Yu is a mezzo-soprano studying voice at the Yong Siew Toh Conservatory in Singapore. Both showed complete self-assurance in their stage manner, revealed solid technical abilities and were every bit as sure-footed and confident as the best of professional soloists. But the key word here is “Young”. At the current stage of their musical development, neither is really in the top league. They certainly did not disappoint musically, but neither did they present the kind of dazzlingly brilliant performances which might have warranted the unrestrained cries of adulation with which at least one section of the audience greeted them. It’s good to have friends and supporters – that’s the home crowd advantage – but their response should not be taken as a true indicator of performance quality. Richard Strauss’s Oboe Concerto is a delightful thing, its wonderfully sinuous melody, weaving in and out of chromatic chicanes like a Malaysian moped in Kuala Lumpur traffic, fluidly manipulated by Lee in an admirably nonchalant manner. She even revealed a deeper understanding of Strauss than merely playing the notes right, in her cadenza-passages where she brought in some individual ideas about operatic drama and witty poise. This is well on its way to being a very impressive interpretation of a very complicated work. But Lee’s youth revealed itself in the unequal battle she was fighting with the SSO who were making no concessions to youth or inexperience. Neither were they making any concessions to the delicacy of Strauss’s writing, and barged their way through his often subtle textures like a herd of bulls let loose in an emporium offering for sale porcelain artefacts. In Strauss’s moments of gentle dialogue between solo oboe and clarinet, the clarinet won hands down, and only the first violins – always beautifully blended and ingratiatingly smooth – seemed to have tuned into Lee’s interpretative views. A more mature and seasoned oboe soloist would surely have nipped this kind of orchestral hostility in the bud by turning round in rehearsal and telling them all to Bugger Off until they were willing to toe the line. At 22 student Lee would probably not have the courage to do that. Elgar’s orchestra for Sea Pictures is considerably larger than Strauss’s for the Oboe Concerto, but it emphasises the deep and rumbling tones to allow room for the solo voice to reveal itself. Jason Lai understood the music’s Wagnerian debts, and drew some powerful pictures in orchestral colour to underpin Jade Tan’s singing. For her part, Tan has a fine voice with plenty of strength, a strong sense of pitch security and excellent and idiomatic diction. 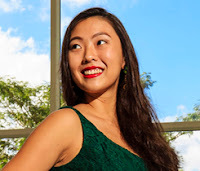 She performed Sea Pictures when she won the Conservatory’s Concerto Competition last year, and it is good that she has made this fine work something of her own. But I am not sure it was a good idea to use it as the vehicle with which to make her professional concerto debut. A student orchestra and a student audience is one thing, a professional orchestra and a paying audience quite another, and there were times when she was in danger of drowning beneath the sheer weight of professional orchestral forces. As with Lee and the clarinet, in a straight fight between Tan and the French horn, the horn won hands down, at one point coming in with such abrupt vehemence that it sounded like the raucous squawk of a passing albatross. In general the orchestra seemed completely unaware of the particular problems in balancing a low solo voice with a big chunk of heavy brass, and it certainly did not help that Lai chose to dispense with the moderating influence of the organ which would surely have smoothed out the percussive edge of the wind in the “Sabbath Morning at Sea”. Elgar knew what he was on about when it came to orchestration, and recognised that quite often more instruments mean less power. However, the problem of orchestra and voice balance in Sea Pictures is well known and can only successfully be overcome by a voice which, setting aside power (and Tan has plenty of that, even if there is scope for more), has the range of colour and dynamics to turn it from being merely a vehicle to deliver the text into a distinct musical timbre. Elgar uses the voice as a distinct musical instrument, and Tan does not yet possess the range of dynamics, colour or flexibility to fit in with such a hefty orchestra. It would be easy to suggest that youth and inexperience were the main reasons for any shortcomings in the first half. But they weren’t. The concert’s second half showcased the SSO on its own playing Brahms 2, and it was pretty obvious pretty soon where the real problem lay. Jason Lai had a fairly compelling idea of what he wanted the Brahms symphony to do. He saw its glorious melodic lines flowing effortlessly over the bar-lines and on into the distance beyond, he saw the wit and charm of the light-hearted third movement, and he saw excitement and joyful fervour in the exuberant finale. He communicated that to the audience and to the first violins, who again shone with a lovely, rich and conglomerate tone. He did not get his message across to the rest of the orchestra, and while this was not a total shambles, at places it came pretty close. Entries came late or early, dovetailing lines fell into the abyss or collided clumsily, ensemble cracked and inner balance was distorted. It was a triumph of sound over music, and while it was noticeable that several sectional principal were not in place, an orchestra has to be greater than its principals. If it can’t work together without them, there is something fundamentally wrong. No doubt the next time the SSO goes on tour or releases a CD it will be enthusiastically received by critics (especially, for some reason, those in North America). They will have every justification in proclaiming the SSO something special and proof that the future of Classical Music lies in South East Asia, and the SSO will gleefully add these ecstatic outpourings of international critics to its database of Nice Things To Put On Publicity Notices. The trouble is, for those of us who hear it week in week out, finding it on top form is still a matter of luck rather than judgement.